You know how if someone starts a sentence with "I'm not racist but..." then the rest of their sentence is pretty much always 100% racist? 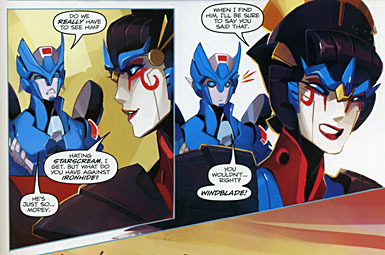 Today we're reviewing the first issue of the Windblade comic, a book that engendered a lot of discussion beginning with "I'm not sexist but..."
Who is Windblade? In the aftermath of Dark Cybertron, Windblade takes the planet by storm! But where did she come from - and what does her secret mean to the future of the Transformers? A powerful new chapter in the Transformers saga begins here! I didn't read "Dark Cybertron," but I've bought enough Generations Deluxes to get a basic idea of the goings-on. The issue opens with a quick recap page that pretty much boils down to "bad things happened, but the good guys won" (which, to be fair, is a pretty accurate recap of every comic story ever, so that's not a slam on it) before jumping ahead six months to start the story proper. For those who haven't been following the story closely, there are a few unclear points near the beginning. Windblade wishes she was home; where is that? Another character calls her "Cityspeaker"; what does that mean? If you keep reading, however, these questions get answered very quickly - writer Mairghread Scott does a great job easing new readers into the story, making sure the unfamiliar elements aren't too overwhelming (and that they don't stay unfamiliar for long). A story is nothing without conflict, and right at the outset, this one is put under the threat of a ticking clock. Cybertron is in a bad way after the last story, and things are falling apart. Windblade is the one in charge of fixing them, and she's feeling the pressure. She's also trying to solve a mystery, and learn about the inhabitants and politics of her new world - and then the situation really blows up! 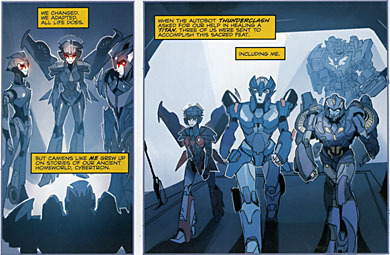 Windblade is, herself, a blank slate. She's the Fan-Built-Bot after all, and while we were able to vote on her personality (valiant, sneaky, hotshot, secretive, wild man, or grumpy), that's just part of who she'll be. In this issue alone we see her as a dedicated worker, a savvy investigator, and a bit playful with her friends. She's not a one-note cartoon, she's a rounded character with goals and motivations that inform the way she interacts with the other Transformers. Until now (in the IDW continuity), female Transformers were an aberration, the result of a science experiment - in other words, their "femaleness" was just an example of something that made them "other." So there were "normal" TFs, and then there were the girls; hardly the best message to send to your audience (but one that accurately predicted the fanboy rage directed at this book since its announcement - how dare a WOMAN try to write a Transformers comicbook, the Men's Rights Activists gasped, clutching their pearls). For Windblade, it's just a natural state of being, not even something worth commenting on any more than the fact that she's got wings when most Autobots have wheels. But despite being a new character, Windblade is not some boring, flawless Mary Sue; rather, like Mara Jade, she's a character of complexity and contradictions. In short, she's someone you want to read more about, and the story she's in is intriguing enough to bring you back for the next issue (and probably the two after that - it's only a four-issue mini). The last page is pretty sinister! The art, by Sarah Stone, is very cool. It's sort of playful and expressive, falling somewhere between Transformers Prime and Transformers Animated in terms of style. The panel layouts are nicely varied, but they mainly keep straight-edged borders - so when they do get broken apart in a few scenes, it's for an important reason, not to spice up the pages "just because." And when characters break out of those borders, it nicely draws attention to the action in the scene. The coloring is terrific as well (there's no separate credit for it, so we have to assume it's also by Stone). The issue starts with a beautiful sunrise, but it moves to dark chambers illuminated by glowing monitors, the dark and cavernous underbelly of the planet, the bright city streets at night, and more. There are two sections where the color gets very drained out, and it's done with a storytelling purpose that makes it beautiful. Rather than a letters page, Windblade #1 closes with a greeting from writer Mairghread Scott, and this is the part where I have to question my objectivity as a reviewer: knowing all the misogynist idiocy that bubbled up because of a comic written by a woman, drawn by a woman, and starring a woman, the letter really seems like a "look, fanboy, I'm a real fan and I know what I'm doing here" essay; and it's true, she does, but would I read that same meaning into it if it weren't written by a woman? 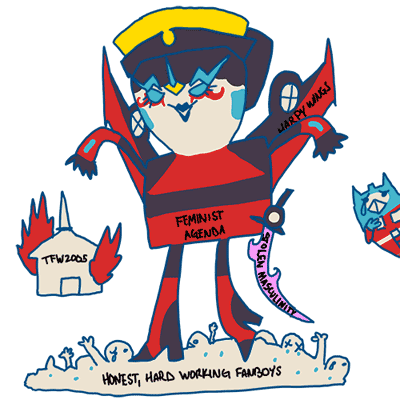 I can't tell, which unfortunately puts me in the same camp as the idiots who think Transformers is going to be ruined forever if it gets any feminism on it. 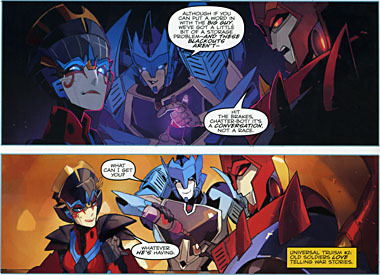 Windblade #1 is, hands down, a good comic. It looks excellent and the story has a promising hook. If this is what "not understanding Transformers" looks like, bring it on. 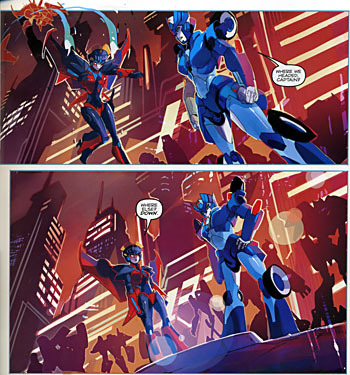 This entry was posted in blog exclusive review, comics and tagged Transformers, Windblade. Bookmark the permalink. Great review! I've been looking forward to this comic for a while now, and I'm excited to read my copy to tomorrow. There's rumbling's of it becoming a third ongoing if it sells well enough, which based on the previews and the holy-crap-so-gorgeous art, I'd probably be on board for. Tell me where those rumblings come from. Promise me this is a credible source. Swear to me I won't feel like an idiot for getting my hopes up. I'M BEGGING YOU, TELL ME WHAT I JUST READ IS TRUE! This is the most I've enjoyed Transformers since Animated, I don't want it to end! 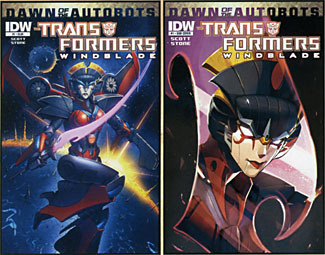 Not much of a TF fan, but I must say, I rather like the Windblade design, and the artwork shown above looks really good.